I've been saving this special post for today. It fits well for this week because it is about love for Valentine, it's Luna New Year this weekend which means a lot of Yellow, and it's my favorite Lady Blue. I am sharing a story or Vietnamese mythology that I loved as a kid. Long, long ago there were two snakes sisters training in the great mountains for thousands of years to become humans. One was Blue and the other was White. The day they were successful, they visited a Valley close by. Amazed by the wonders of human interactions, they longed to have a normal mortal life. They were exceptionally beautiful, the kind of beauty that no one could deny. White soon met a man and fell in love, then married him and the three lived very happily together. White was amazingly talented in herbal medicine, so she and her husband opened their own clinic. She was kind to all her patients and treated them equally even the very poor ones. Not too long after, the snakes sisters were discovered by a monk. He warned the husband to be careful because the sisters were not true humans but devils. The story continued about battle after battle as the sisters fought to defend themselves from the monk. In the mean while, White's husband scared and convinced by the monk that his wife was evil and would bring harm to his life fled to the temple to hide out. Blue escaped and went back to where she and White came from. Determined to rescue White from the monk, Blue trained for over thousands of years thereafter.Blue became very successful and her magical powers were of farthest ranks. She defeated the monk and brought White out of captivity. It was said that Blue and White still visited the Valley once in a while, but not sure if they ever met another man or men and ever fell in love again. I cut the story down to extreme brevity, but the best part about this story is the love White had for her husband. This love is beyond today’s Valentines – it doesn’t exist anymore, or does it? The story sent such a strong message to me - probably the opposite way from what it was meant to do- that I vouch not to ever love a man like the way White loved her husband. I like Blue, for her courage and control and I like to think that Blue had learned from White's human life and stayed aware. I have seen many beautiful women burnt on love, and I strongly believe in two way streets or none at all. 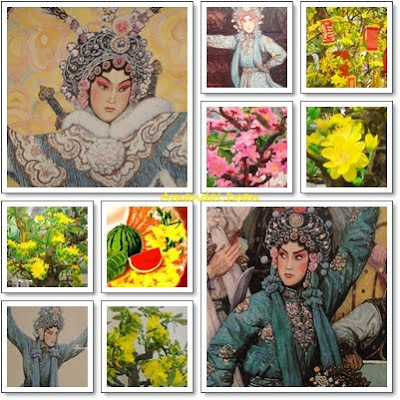 Original illustrations from Song Nan Zhang from the book of Lady White Snake. I am please that you came to visit me today. Wonderful story about Lady Blue and lovely pictures. Happy Valentines day. Where have I been all this time? I haven't aware of this story before..
Great story of courageous women..Beautiful mosaic! A love story just in time for Valentine's Day, and it even includes blue! Happy Blue Monday. Thank you for sharing. I love the pictures of White and Blue, so much detail. The story is wonderful! It is always fun to find out about other cultures. I loved your story today of Lady Blue. I have not heard this one before. You have a very interesting blog. Thanks for sharing so much from your country. & Bach Xa...You know it. I love the myths, but the images are so beautiful. You have an awesome blog, and express yourself well! The story is beautiful and I have heard it before. You told it so well and the pictures were exquisite. I have always wanted a pair of bright blue snake skin pants. I just can't seem to find a pair anywhere. Anyone have any suggestions for where to look?